Whether your garden is a place for you to quietly escape the world or where you invite all of your friends on the weekend, you are likely to need at least some furniture for the garden. Before you get overwhelmed by the endless choices in garden furniture, take some time to consider your needs. When you do, you'll find yourself more relaxed and prepared to make decisions. Your first consideration will be the space available to you. Do you have a large area for entertaining? Do you have a nice deck? Do you only have a tiny balcony? If you only possess a small space, an eight piece patio set would be impractical. If you have a large space for guests, a little bistro table and folding chair will be less than helpful. If your garden has many shade trees an umbrella table would have little use. Also, do you want to draw guests into your garden area? Would you prefer that your garden be closed off to visitors? Think about how much room you have and the types of furniture that will meet your needs. Another concept to think about is the style of your garden. Do you have a formal garden or something more fanciful like a Butterfly Garden? Select furniture to match the personality of your garden. Look for things that look like they belong in your garden and nowhere else. All of these ideas are things to have in mind when you begin to shop for furniture for the garden. 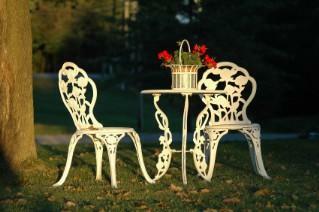 Most furniture for the garden is designed with protection from ultraviolet rays and chlorine. Additionally, it should dry easily and be easy to clean. At least you don't need to worry about those things! After you have decided what you want your furniture for the garden to be made of, it's time to decide on specific pieces. Imagine "living" areas you would like to create in your garden. Think of the pieces you will need to create each space. Would you like to create a relaxing Tea Garden? If so, some bamboo pieces will fit right in. Maybe you just have just started gardening and only need a simple bench to take a break now and then If you need some ideas, check out a few of these places online who specialize in furniture for the garden. Wind & Weather has a lovely selection of furniture for the garden. Look in their outdoor furniture section and you will find everything from a cozy two-person hammock to a rugged hand-forged garden bench. Consider adding other accessories as well to give your garden space a personal touch. Target has an nice selection of garden furniture from simple benches to elaborate dining sets. You'll find plenty of choices here. A4 Adirondack Chairs sells cedar Adirondack furniture for the garden. All furniture comes unassembled but assembly is easy and soon you'll have lovely garden furniture to relax in. Oxford Garden has just what you need for a traditional English garden. You'll find beautiful wood benches, tables and more. You can shop online or use the handy dealer finder to find a store near you if you prefer to shop in person. 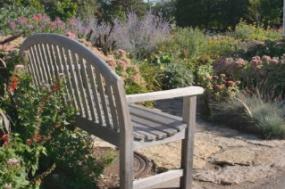 Garden Benches.net carries more than just garden benches. Check out the large selection of swings, patio sets, fire tables and more. You are sure to find just what you need for your garden. Gardener's Supply Company has furniture and anything else you may need for your garden. After you've picked out your furniture, take a look at the adorable solar cattail garden accent lighting! After you have put some thought into the type of garden that you have and how much space you can devote to furniture for the garden, you have likely found some lovely pieces. After all that work, pour yourself a glass of iced tea and relax on your new lounge chair. You definitely deserve it.